When the Cleveland suburb of Euclid first zoned its land in 1922, the Ambler Realty Company was left with a sizable tract it could no longer sell for industrial use-and so the company sued. What emerged was the seminal zoning case in American history, pitting reformers against private property advocates in the Supreme Court and raising the question of whether a municipality could deny property owners the right to use their land however they chose. 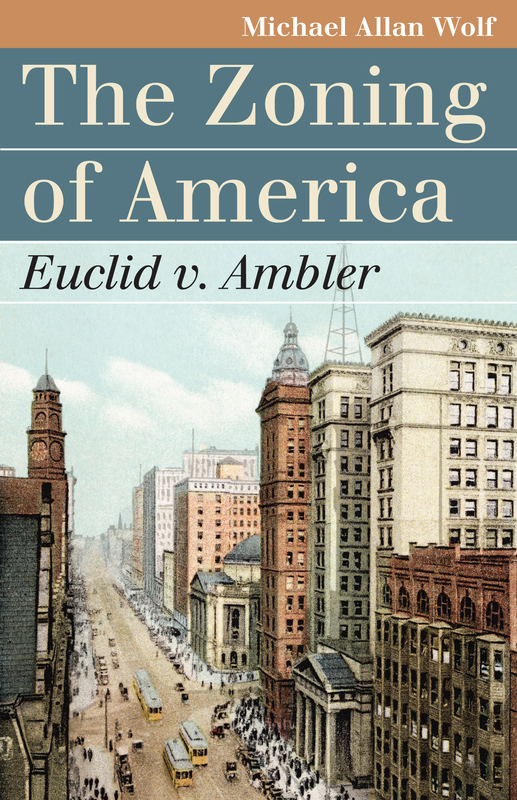 Reconstructing the case that made zoning a central element in urban planning for cities and towns throughout America, Michael Allan Wolf provides the first book-length study of the Supreme Court's landmark Euclid v. Ambler decision. Wolf describes how the ordinance, and the defense of it, burst onto the national stage and became the focus of litigation before moving all the way to the nation's highest court. He subsequently reveals how and why Justice George Sutherland broke from the Court's conservative bloc to support the urban reform movement eager to protect residential neighborhoods from disturbances created by rapidly expanding commercial, industrial, or multifamily uses of land. Following that decision, America saw the rapid proliferation of zoning ordinances, which greatly increased the power of local government to control and rationalize urban planning. As Wolf attests, many of today's environmental and land use laws might not have been deemed legal had Euclid v. Ambler been decided differently. But he also points out the potential dangers that emerged from the decision, such as its anticompetitive impact on the real estate market, its catalyzing effect on suburban sprawl, and its establishment of a legal basis for excluding minority groups from neighborhoods. Wolf's compelling account makes it clear that Euclid v. Ambler fundamentally altered how we think about the urban landscape, changed the way our cities and suburbs are organized, and left a long shadow over subsequent cases such as the controversial Supreme Court decision in Kelo v. New London (2005). Michael Allan Wolf is Richard E. Nelson Chair in Local Government Law and professor at the University of Florida Levin College of Law. He is general editor of Powell on Real Property, editor of Strategies for Environmental Success in an Uncertain Judicial Climate, and coauthor of the fourth edition of Land-Use Planning: A Casebook on the Use, Misuse and Re-use of Urban Land.